Oregon’s 2014 season was one to remember. Its fans witnessed another 10-win season, multiple records broken, a berth in the National Championship Game and a Heisman Trophy winner in Marcus Mariota. Circumstances, as well as players, have changed as the team heads into the 2015 season. According to an article published by ESPN, Oregon was chosen to return to the college football playoff in four of the 37 total ballots given out to the staff. There are many questions heading into the 2015 season for the Oregon football team, but let’s look at some other factors that could assist Oregon in reaching the destination that all teams are trying to get to: the College Football Playoff. 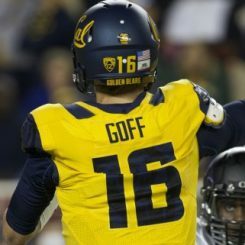 Jared Goff and the Cal Bears are one of the more mysterious teams in the Pac-12. The Pac-12 North lost a lot of players at the end of the 2014 season, mostly at quarterback. Cal and Stanford are the only teams returning their starting quarterback from a season ago. Washington‘s quarterback competition has question marks, most likely leading to the Huskies starting a quarterback that is inexperienced. Washington State and Oregon State both had their starting quarterbacks graduate and now are in the same situation as Washington, leading to a quarterback competition with players who haven’t seen a lot of playing time. Stanford‘s dominant defense from years past has continued to move on and graduate players, leaving many spots to fill. There will still be a lot of talent on that side of the ball for Stanford, just not as much game experience. A team that has been led by its defense the last few seasons may have to rely on its senior quarterback and offense to get wins. Cal is arguably the most mysterious team heading into the 2015 season. They have gone through the tough times and return a total of 18 starters from last year, as well as their starting quarterback from the last two years. If Cal can get their high-powered offense to where Sonny Dykes envisions it, Cal could be a scary good team come this fall. Oregon looks to sweep the home-and-home series with Michigan State this year in East Lansing. 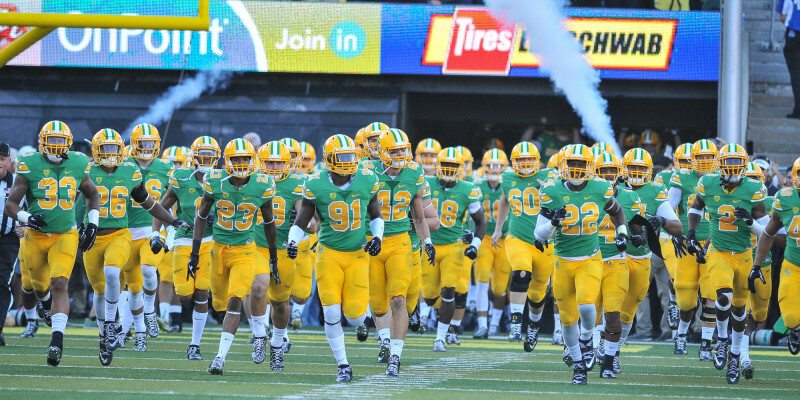 Oregon has seven home games on the slate combined with only five away games. The Ducks face Pac-12 foes Utah, Cal and the Cougars at home this year after all three of them gave Oregon problems last year when the Ducks played them all on the road. Oregon closes out the year with two huge home games: rivals USC, and the Civil War against Oregon State. Having the luxury of being at home for those two weeks may pay dividends if the Ducks are in fact in the hunt for the college football playoff. Oregon’s away games are the big question when it comes to their schedule. It is their turn to visit East Lansing, Michigan, to face a predicted Top 5 team in Michigan State. This is arguably the most anticipated non-conference game of the year, thanks in part to last year’s game living up to the hype. Oregon faces Colorado and Washington on the road this year, a year in which both teams are still trying to get over the hump of not being truly relevant in the Pac-12 North. Mid-season, Oregon will visit Tempe against an up-tempo Arizona State team that could be on the cusp of taking their program to the next level. The Arizona State-Oregon game will be on Thursday night, which only adds to the drama given Oregon’s recent history with Thursday evening games. Finally, Oregon will play Stanford. This game has decided who wins the Pac-12 North the last few seasons and always has a ton of attention. Oregon will look to avenge its loss the last time they traveled to Palo Alto. 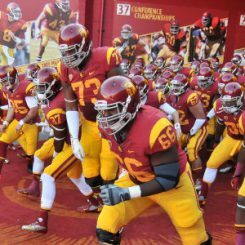 Oregon will renew its rivalry with USC on November 21. 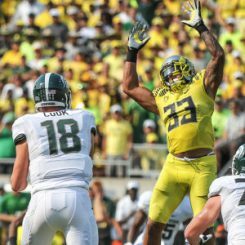 Oregon will potentially play five ranked teams over the course of the 2015 season, and maybe a sixth if they reach the Pac-12 title game. The takeaways from the early non-conference game against Michigan State could go a long way in influencing the committee to choose Oregon as one of the four teams in the college football playoff. Scheduling an opponent of Michigan State’s caliber in Week 2 proves that Oregon isn’t scared of playing anybody. If it comes down to Oregon and another team for the last spot on the playoff, Oregon’s chances should be very good. If everything pans out and the Ducks can go unscathed playing five ranked opponents, it puts the Ducks in a good spot to return to a playoff game this year. There are always going to be hurdles a team has to face throughout the course of a year, but how Oregon’s schedule stacks up opposed to other power five conference schools is very generous. The Ducks will be tested and will have to prove their worth to the College Football Playoff Committee, but as of now the odds seem to be on Oregon’s side. If the Ducks can find someone to step up and lead the juggernaut that is Oregon’s offense, then the Ducks chances of repeating as Pac-12 champs and getting into the college football playoff will increase exponentially.